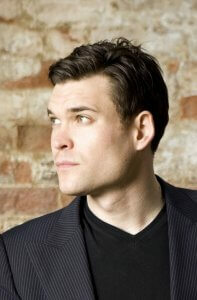 Composer, conductor, pianist Ryan Wigglesworth was educated at Oxford University and the Guildhall School of Music and Drama; between 2007 and 2009 he was a Lecturer at Cambridge University and a Fellow of Corpus Christi College. His reputation was established with his orchestral work, Sternenfall, written for the BBC Symphony Orchestra and premiered under the composer’s direction in 2008. Augenlieder, an orchestral song cycle for soprano Claire Booth, received the vocal prize at the 2010 British Composer Awards. More recent works include Locke’s Theatre, commissioned for the BBC SO and Aldeburgh to celebrate Benjamin Britten’s 100th birthday on 22 November 2013 and Echo and Narcissus, a dramatic cantata for mezzo, baritone, three female voices and piano co-commissioned by Aldeburgh, Wigmore Hall and Musik im Riesen and premiered at the 2014 Aldeburgh Festival by Pamela Helen Stephen, Mark Padmore and the composer. He is currently Artist-in-Residence with English National Opera, where he conducts regularly. The residency culminates in the March 2017 premiere of his first opera, The Winter’s Tale.